Supercar NEDHEAD BN7 Series Cylinder Heads are proven capable of 750 horsepower, naturally aspirated, with a complete NEDHEAD Performance Enhancement Phase 4 or Phase 5 System installation in 2006-2013 Corvettes equipped with the LS7 Engine. 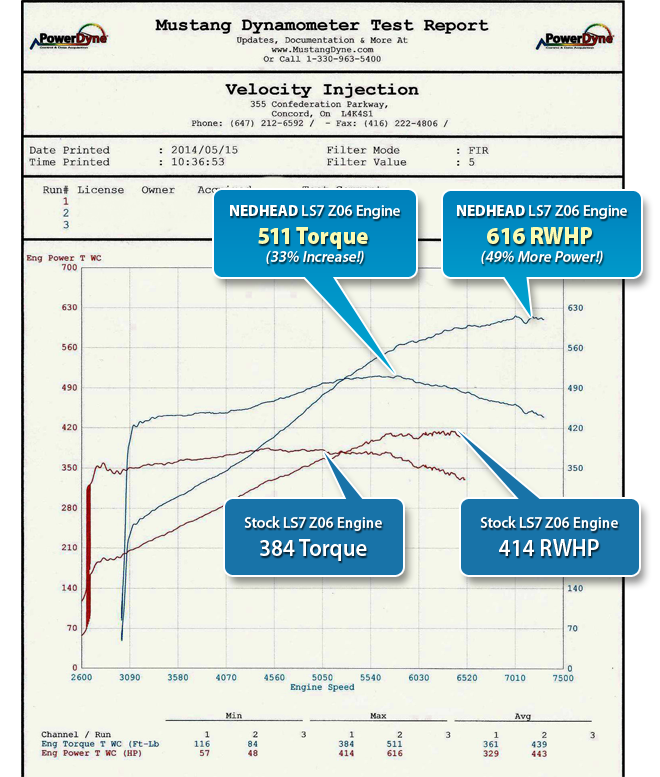 NEDHEADS are developed to work as a complete system with 6 Phases of LS7 Engine Performance Enhancements available incorporating unique custom modified Cylinder Head modifications and custom designed camshaft profiles designed by Ned for each of the following Phases of Performance. Big Power “Naturally Aspirated” with No Power Adders! The NEDHEAD systems are unique in the ability to consistently produce superior performance results without the need for traditional power adders such as superchargers and turbo chargers. The superior all motor power performance of the SUPERCAR NEDHEAD BN7 Phase 4 & 5 Systems are proven on chassis dyno tests with NEDHEAD equipped Z06 Corvettes producing 100 horsepower more than the Supercharged ZR1 Corvette. SUPERCAR NEDHEAD BN7 Systems deliver 600+ Rear Wheel Horsepower at over 7200 RPM and drag strip quarter mile performances in the mid 10 second range at 139 MPH. This performance is delivered with full Z06 weight, production Z06 wheels, stock suspension and functioning catalytic converters. This is a level of superior engine performance (139 MPH in Drag Strip 1/4 Mile ) that many Supercharger Systems, Turbo Charger Kits and Nitrous Oxide Systems are unable to provide using 94 Octane pump gasoline. To fully comprehend the superior performance of the SUPERCAR NEDHEAD BN7 SYSTEM a review of an engine power test comparison is necessary between a stock LS7 engine in a Z06 Corvette and a NEDHEAD BN7 System in a Z06 Corvette. This Chassis Dyno Test of engine power demonstrates a 200 Rear Wheel Horsepower increase with maximum horsepower being extended from 6200 RPM to 7200 RPM. 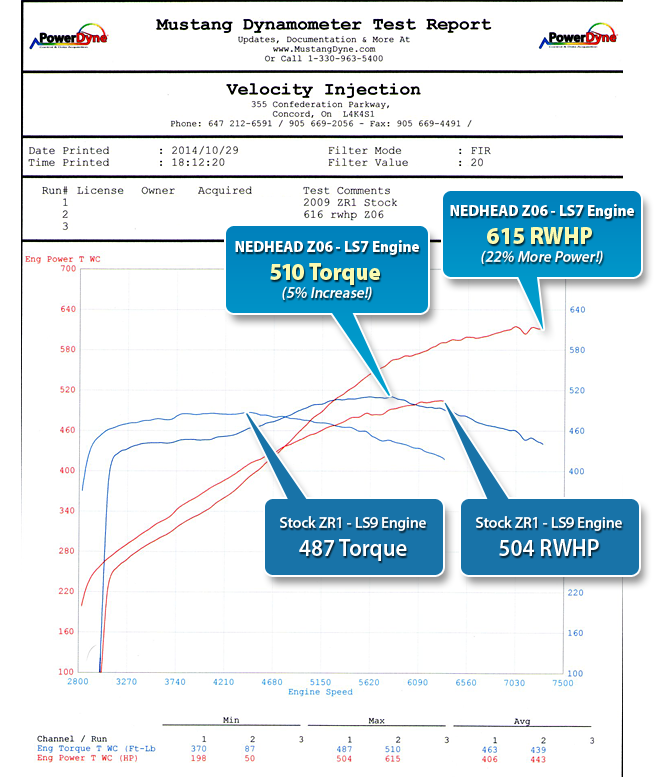 To better understand the superior naturally aspirated performance of the SUPERCAR NEDHEAD BN7 SYSTEM a review of an engine power test comparison is required between a Supercharged ZR1 Corvette and a Z06 Corvette equipped with a NEDHEAD BN7 System. The naturally aspirated LS7 Engine in the Z06 Corvette produces 100 RWHP more than the Supercharged LS9 engine in the ZR1 Corvette. The SUPERCAR NEDHEAD Performance Enhancement Systems are designed to work as a complete engine operating system. Each Phase of engine performance is custom modified with different cylinder head modifications and different camshaft profiles that are designed to work in synchronization to deliver maximum engine efficiency. Phase 1-2-3: These 3 systems are designed to deliver performance with the production engine and actual engine performance can vary depending on the quality of the engine. The Phase 1 uses the production GM LS7 Cylinder head and the Phase 2 & 3 utilize the NEDHEAD BN7 heads. Phase 4 -5: The Phase 4 & 5 systems require an LS7 Engine rebuild with special forged pistons incorporating the structural integrity to run 8000 RPM. The Phase 4-5 systems have 7800 RPM capability and develop maximum power in the 7200-7400 RPM range. This makes the NEDHEAD Phase 4 & 5 LS7 engine systems the most technologically advanced on the street. Phase 6: The Phase 6 System incorporates a Special NEDHEAD BN7 Supercharger Series Cylinder Head designed to work with big boost pressure supercharged LS7 engines. Actual Engine Performance can vary depending on the condition of engine and the quality of fuel being used. This system is our next step up for Z06 Corvettes already equipped with headers and air intake system. Call 416-988-0018 to Order Now! Maintains C6 Z06 Stock Exhaust System from exhaust manifolds to tail pipes. Phase 3 NEDHEAD & Phase 3 Custom Camshaft System with ARH Headers and Vararam Air Intake System. Phase 4 NEDHEAD & Phase 4 Custom Camshaft System with ARH Headers and Vararam Air Intake System. Phase 5 NEDHEAD & Phase 5 Custom Camshaft with ARH Headers and vararam Air Intake System.